This fine collection of six designs of stair rods is traditionally manufactured with elegantly turned ends and made from solid brass. As such, the Premier stair rods for stairs is a superior quality range. The attractive designs and pristine finishes prove to be an outstanding combination. Each of the six designs in the Premier collection is available to order for either a stair runner or fitted carpet. 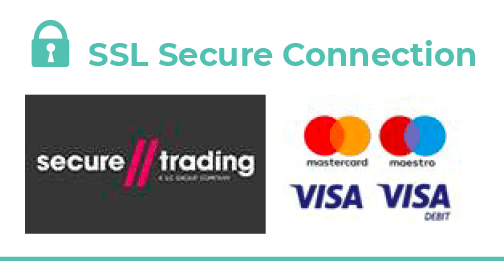 Simply select the relevant option when placing your order online. 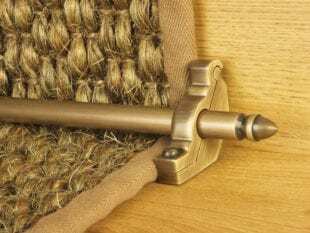 The carpet runner rods designed to be fitted with a runner carpet are supplied with hinged brackets, which are located either side of the runners. The rods feature an integral finial either end. 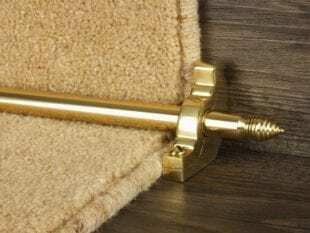 For a fitted (full width stair runner) you can choose the Front Fix option with Front Fix brackets; these fit over the front of the rod (only) and are attached by screwing through the carpet into the staircase.  The Side Fix option is likewise suitable for a fitted carpet but does not have the decorative finials−it simply spans the entire width of your staircase and fixes to the sides of your staircase. The decorative finials are an integral part of the Premier stair rods collection, turned and lathed from one piece of metal. There are six designs: Balmoral, Chatsworth, Hanover, Lancaster, Windsor and Woburn. The Hanover has an extra design dimension, being a hexagonal shaped rod.  The other five designs feature a cylindrical rod, which is available in the standard 12mm (1/2”) diameter, plus the larger 16mm (5/8”) for wider staircases.  Solid core, high quality brass stair rods, offered in ten metal finishes: polished brass, antique brass or satin brass, antique bronze, polished chrome, brushed chrome, satin and polished nickel, pewter and black. 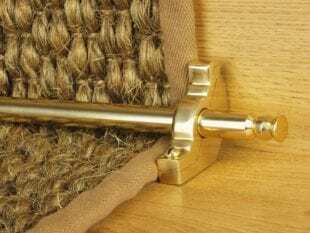 Each rod is supplied with a pair of matching-finished stair rod brackets and screws, suitable for installation with carpets or natural flooring fitted with underlay.  The standard 12mm (1/2”) brackets supplied have a 14mm clearance to allow for the underlay and carpet, whilst the 16mm (5/8”) brackets have a 15mm clearance. 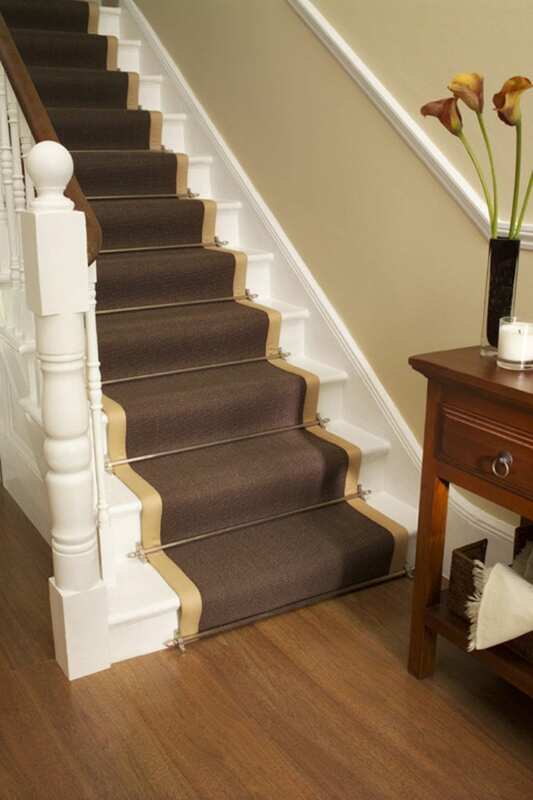 Suitable for fitting on stair runners or fitted carpets – choose the correct fitting option. 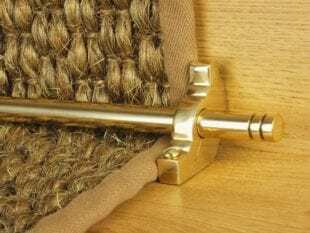 It is important to note that, like other stair runner rods, the Premier stair rods are purely decorative and do not fix the carpet to the stairs; a stair runner must be secured by another means of installation such as gripper. 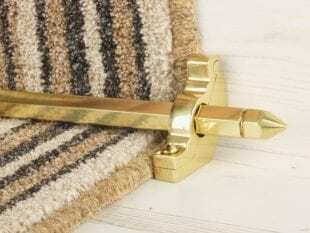 For further information about measuring up and fitting stair rods, please see here and for matching door thresholds try the Premier thresholds.